How to Build a Little Box of Poems | Blog My Wiki! 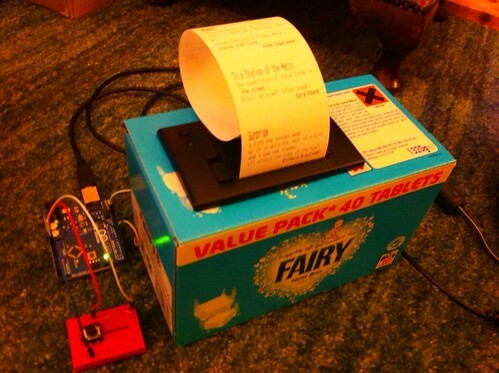 I wanted to build a little internet printer, spewing out weather and tweets and the like. 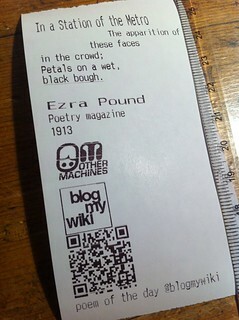 When I was testing my thermal printer, however, I got bored reading sample text and replaced it with a short poem. 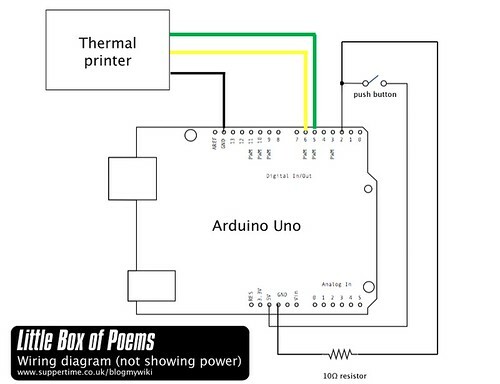 And that gave me an idea: why not make a self-contained box that just prints a random poem when you press a button? A few people seem to really like the idea, especially those working in education. It could be a great school project combining four different subjects: Science/Phyisics (the electronics and circuit wiring – why is a resistor needed? How can you supply the correct voltage & current to both Arduino and printer from 1 power supply? ), ICT (programming the Arduino), DT (making the box) and English (get your class hunting for great, short poems, or better still get them writing their own Imagist poems, limericks or haikus). something to power the printer and the Arduino – the printer needs a hefty power supply that can provide between 5 and 9 volts at at least 1.5 amps. The Arduino needs a similar voltage but takes much less current. some till roll – either this http://proto-pic.co.uk/thermal-printer-paper-34/ or buy some from Ryman’s or another office supply store, and spool some off so the roll fits. a box to put it in – I used a Fairy washing tablet box made of strong cardboard. 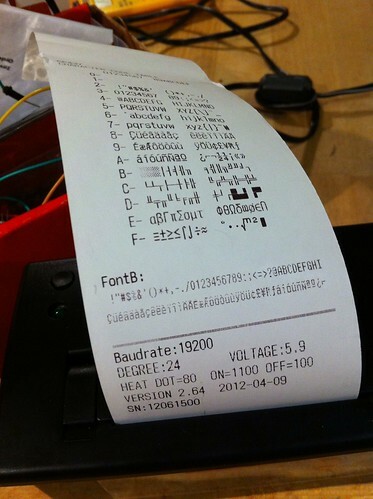 If the baud rate is anything other than 19200 you need to tweak a number in my code, and in the Adafruit Thermal library – that’s a bunch of code that makes it easier to tell your printer what to do. They have instructions on their web site for how to install it. It’s essential. I used a tiny breadboard that I got with my Arduino kit to test the code – it connects a small black push button via a resistor. I later replaced the small black button with a huge red button that I fitted to the top of the box. I powered my Arduino by USB, either from a computer or from an iPhone charger, and I used a separate 5v 2A power supply for the printer – I daresay they can be wired so only 1 plug is needed. You can download my Arduino source code here or read it below. There are three files in the zip, the main one is displayed at the foot of this blog post. The other 2 files are logos. Feel free to edit it with your own choice of poems – I’m not sure how many can be crammed into the Arduino’s tiny memory, but I daresay you can get more in if you remove the graphics – I have a little ‘Blog My Wiki’ logo and a QR code that links to this blog. I used the Adafruit instructions on how to make graphics for the printer – I have to say that using ‘Processing’ to make them worked much better for me than using LCD Assistant. I used a random free web site to make the QR code and carefully resized it in Photoshop and saved it as a PNG. The poems are split into three arrays – one for title, one for the main text of the poem, and a third for the author. This is because I wanted to print headings, text and footers in diffrent styles, and this seemed the simplest way to do it. ICT challenge: is there a more efficient way to code this? 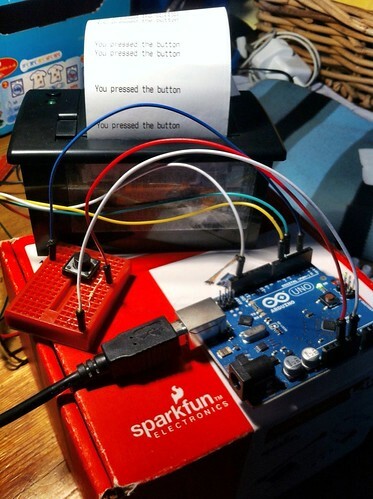 So wire up the printer and switch to your Arduino. Upload the code, and press. Hopefully you will get a random poem. Rip & read. Share & enjoy. 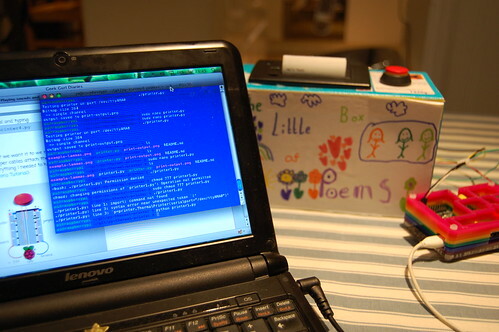 Thanks to Twitter, The Little Box of Poems inspired Carrie Anne Philbin’s Little Box of Geek – this is a project based on a Raspberry Pi rather than an Arduino. I’ve found that I can only get about a dozen short poems in the Arduino before it starts spewing out gibberish – I’m guessing because it’s running out of memory. Clearly the Raspberry Pi has much more storage by default and, crucially, is easy to get on the internet, so I’m rebuilding my Little Box of Poems with a Raspberry Pi filling. I’ll post my results when I get it working, which shouldn’t take too long thanks to Carrie Anne’s excellent blogposts and videos. Do visit her site and spread the word about her important work which is getting girls into IT. You can follow @GeekGurlDiaries on Twitter. This entry was posted in Arduino, education, ICT, literature, poetry and tagged Arduino. Bookmark the permalink. Pingback: Little Box of Poems with a Raspberry Filling | Blog My Wiki! Ive tried running your code and it seems to not understand a lot of it. i have the adafruit library. Firstly it has a problem with this line saying it has no matching function. Then throughout the code for the poems it doesn’t recognise the printer command. I really like the project and hopefully if i can get this working i can adapt it. I’m pretty new to all this so don’t feel like you are patronising me when explaining things!